Right after Gov. Larry Hogan finished his State of the State speech Wednesday, one Republican lawmaker quipped that the Democrats were heading to the nurse’s station. They wanted to have their hands looked at after sitting on them for an hour. That was a gross exaggeration. The speech was only a half hour long, and some Democratic legislators did give up a smattering of applause here and there. Mostly they sat in stony silence as their Republican colleagues jumped to their feet repeatedly, clapping and even cheering as Hogan recycled much of his campaign rhetoric, then detailed a legislative program to implement some of his promises. Senate President Mike Miller, smiling at the outset, was scowling by the end of the speech. Afterward, Miller called it “horrible” and said the governor was trashing Maryland and offering up campaign promises he couldn’t fulfill. Sen. Guy Guzzone of Howard County called it “the worst speech ever;” Baltimore County Executive Kevin Kamenetz called it “a very partisan” speech. Democrats have grown tired of Hogan’s repetition of his standard stump speech that he continues to use with variations depending on the setting. He used parts of it in his inaugural address two weeks ago, then lifted them again last week speaking to a Tech Council dinner. The new governor dishes out what is red meat for his supporters, but totally inedible to these Democratic vegetarians. They’re tired of the slogans that blame them implicitly for what is wrong with the state, including high taxes, over-spending, over-regulation, businesses closing, people wanting to leave. The Maryland Democratic Party provided a fact-checking press release. It offered partisan spin but also useful comparative facts. The party even used the conservative Tax Foundation to show Maryland’s business climate and taxes are not as bad as Hogan says. House Majority Leader Anne Kaiser gave a video response to Hogan’s speech, taped before she knew its content. She painted a mirror image of a state in a parallel universe of good schools, educated work force and high-tech job growth. If you strip out the campaign rhetoric, Hogan for the first time lays out some specific legislative proposals. Most are designed to fulfill campaign promises, especially rolling back taxes. Rain tax: As he repeatedly promised, Hogan will ask for repeal of the stormwater remediation fee the state mandated to meet federal pollution requirements. Busch and other leaders say the nine counties and the city already have enough flexibility to change it as they will and no repeal is necessary. The price tag on that is very high. Instead, Hogan will submit more modest legislation that repeals income taxes on pensions for retired military, police, fire and first responders. In a follow-up press release, the governor’s office explained that this will be implemented over several years. Personal Property Tax: The state no longer collects a tax on property, such as equipment and inventory, owned by businesses, but the counties do. Hogan would eliminate the tax on property totaling less than $10,000 largely affecting small businesses. This costs the state nothing, but eliminates the major paperwork entailed. In return, the counties will get back more highway user revenues. Gas tax: In perhaps the biggest tax bombshell, Hogan would eliminate the automatic increases in the gas tax passed in 2013. This will reduce the amount coming in to the Transportation Trust Fund. Democrats fear this cut in revenues will spell the death of the Purple and Red light rail lines. 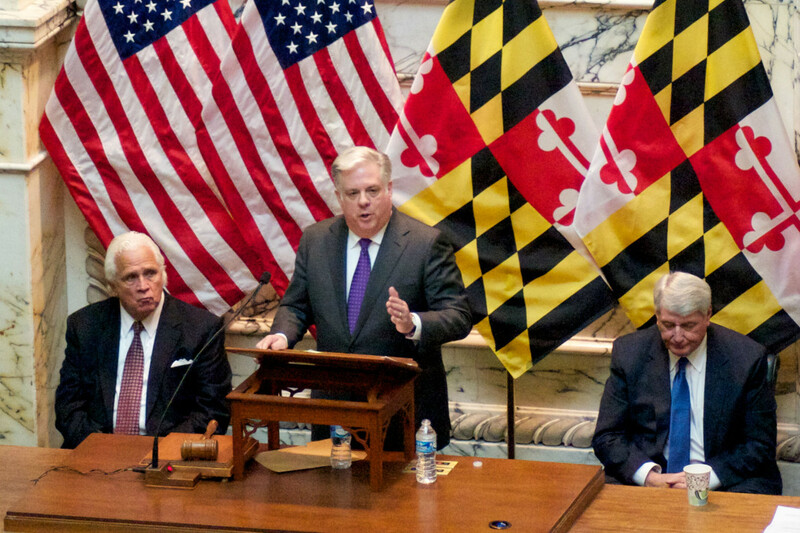 Hogan’s budget and these tax cuts are major legislative goals that will be tough to achieve. But he also chose to tackle two election law reforms that were not part of his core agenda. Campaign Finance: Hogan won his election with $2.5 million in public financing, but that largely depleted a fund built up over many years. He wants to restore the voluntary check-off on Maryland income tax forms and replenish the fund. At a hearing before the Senate Budget and Taxation Committee just a few hours after Hogan’s speech, Democratic Sen. Jim Brochin of Baltimore County testified on his two bills that would do exactly what Hogan is proposing on the gas tax and Fair Campaign Financing Fund. He noted that Hogan “stole” his ideas, but now he has the administration behind those ideas as well. Redistricting: In a move applauded by Common Cause and the League of Women Voters, Hogan will also create a commission to study Maryland’s redistricting process with the goal of creating an independent, bipartisan commission to replace the highly partisan political process that created some of the most gerrymandered and contorted congressional districts in the nation. Miller and Busch both played key roles in the current redistricting process, and Hogan would like to take that power away. But not this year. He already has enough battles to fight with these two presiding officers. WBAL radio’s Rob Lang has extended audio reactions of Busch and Miller to Hogan’s speech, along with Senate Minority Leader J.B. Jennings. WBAL TV posts the full half-hour video of the speech and the full text.